(Newser) – Appraiser Brendan Ryan was at a house in Greenwich, Conn., to take a look at furniture and other items the owner wanted to sell, but it was a framed document hanging on a wall that caught his attention. "I said to myself, 'Oh my God, that's Beethoven," Ryan tells ABC News. 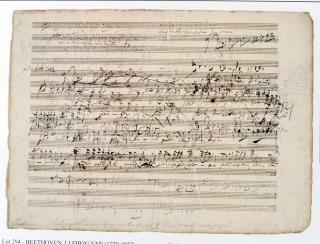 Beethoven's handwriting is "unmistakable," explains Ryan, who is also a composer. His hunch panned out, and what turned out to be a rare 1810 Beethoven sketch leaf of Beethoven's opus 117, König Stephan, sold at auction in November for $120,000, the Journal News reports. But before that could happen, the sketch leaf had to be authenticated and the music identified, and Ryan is providing new details about the weeks-long process. “I equate it to trying to find a word in the dictionary without knowing the first letter," says Ryan, who sought the help of his former music professor, Mel Comberiati of Manhattanville College in Purchase, NY. So he bought if from the unsuspecting home owner for how much? I'm guessing maybe $12. how did a single sheet of Beethoven's highly prized scratchpad appear in this unlikely location? ...anybody? ...anybody?